An amazing gift idea for special occasions, birthdays, anniversaries, weddings you name it, someone would be over the moon with this. This knife is our premium model, its exquisite in every sense. We highly recommend that you hand wash this knife, when you see it you'll want to. Buy with confidence-Satisfaction GUARANTEE Lifetime replacement warrantee against manufacturing defects. KNIVES BUILT TO LAST- We bring to you a range of high quality stunning Japanese chef knives that are hand crafted using only the finest materials this is where quality meets elegance. Welcome to KOI Artisan. PREMIUM JAPANESE DAMASCUS STEEL- Made from Japanese Damascus Steel, 67 layers of Damascus VG10 Super steel ensures that the knife lasts a lifetime. 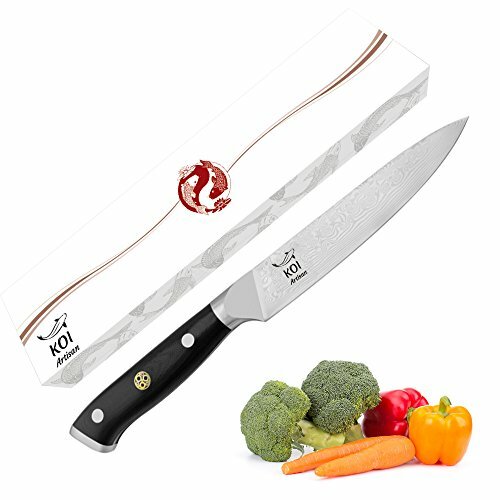 Corrosion and rust resistant the razor sharp knife blade measures in at 5 inches making it a perfect all rounder for professional and amateur chefs alike. ERGONOMICALLY DESIGNED- Individually built each knife boasts military grade G10 black rounded handle which has been developed by our leading product development experts this is robust and resistant to moisture, coupled with a tapered bolster this knife offers a secure and comfortable grip reducing fatigue from prolonged usage. Our signature mosaic inlay motif also acts as a third rivet, beautiful yet practical. TOP PERFORMANCE- Each knife blade is sharpened exactly to a 13 degree V-Ground edge ensuring that each side of the blade is at optimum sharpness. This razor sharpness allows effortless rocking motion chopping whilst ensuring a very clean cut. This razor sharpness technology allows the user to up their game.